Wind power developer EDP Renewables, based in Portugal, will be holding an Open House information session on the 100-megawatt, 30+-turbine, $430-million wind power development they have called “Nation Rise” on December 13 in the arena in Finch. Last week, MPPs Jim McDonell and Grant Crack took letters and petitions containing more than 1200 signatures from citizens of North Stormont and Nation Twp to the Legislature at Queen’s Park, demanding that the contracts for the two Ottawa-area power projects be cancelled. The Open House information sessions are typically just poster sessions with developer staff available to answer any questions. The site plan for the project has not yet been made available although proposed turbine locations are usually part of the application to the IESO for a power contract. The lack of a site plan means there are community members who may yet be unaware that they will have an industrial-scale wind turbine generating power near them. Wind turbines emit a wide range of noise including low-frequency or inaudible noise which has been linked to adverse health effects. Wind turbines have also been implicated in disturbances to the water table and drinking water (Dover Twp, Ontario) via seismic vibration, and wind turbines are responsible for the deaths of migratory birds and endangered species of bats. A few weeks ago, Ontario Premier Kathleen Wynne admitted that her government’s electricity policies have been “a mistake” and that they need to work to get consumer bills down. Last week, Energy Minister Glenn Thibeault admitted that an “arbitrary” choice of wind power as a source of power generation had led to “sub-optimal siting” and community concerns. The Nation Rise power project will cost Ontario as much as $430 million over the 20-year life of the contract. The Open House will be held from 3:30-7:30 PM. 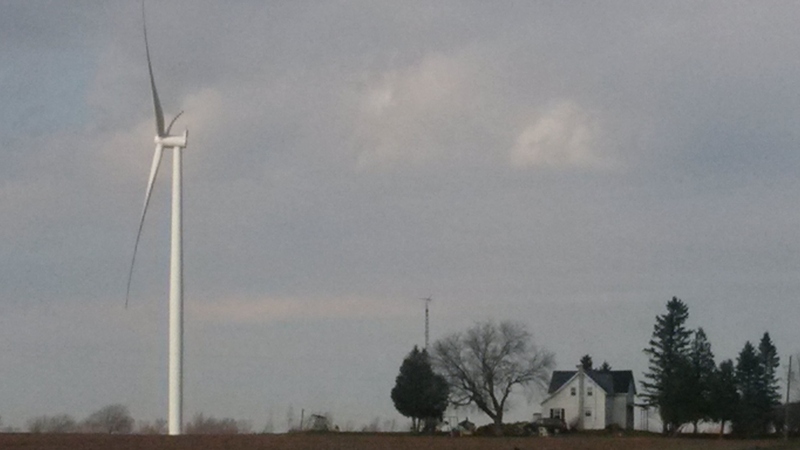 EDP wind turbine and home at South Branch project, Brinston, Ontario. Photo by Ray Pilon. It seems like the Liberals are continuing with their mistake. Not their money nor that they drew any lessons!